[photo credit RJ Sangosti] James Holmes, the ‘Batman massacre shooter’ appears in court on July 23rd in Colorado. When “Reality” runs off with the mind. The self-identified ‘Joker’ archetype takes hold of Mr. Holmes, who has been proven to be under the care of a psychiatrist. It is alleged that he sent a personal notebook outlining his plans for the killings to the university, where he attended classes, to the Psyche dept. prior to the killings. While the Judicial system works to prove whether or not this incident could have been prevented, the fact remains that James was a sick man, lost in his reality. 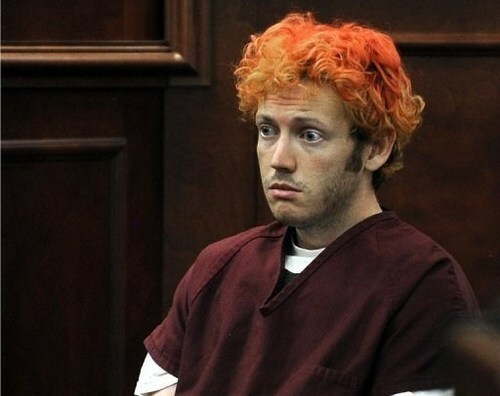 Holmes opened fire in a movie theatre showing ‘The Dark Knight Rises’, killing 12 and injuring 58 people. If Mr. Holmes is proven to have been seeing a psychiatrist specializing in schizophrenia, for his own condition; and sent many warnings out prior to the event, should he be held accountable and sent to his death? The outcries from victims, and society’s demand for Justice, he may very well be killed by the state of Colorado for his ‘evil deeds’, for sure. The alternative? Is it merciful to lock this man away for the rest of his life? In either case, is this cruel and unusual punishment for a mental condition that was beyond his control? And how much control does a person with Schizophrenia really have? The idea that schizophrenia is a disorder of the brain, not just the mind, was proposed as recently as the 19th century, and wasn’t confirmed until the latter part of the 20th. The causes and prevention have been outlined and made public with the advent of brain imaging scans. The evidence points to a reduction in brain gray matter in frontal and temporal lobes. Thus, the condition and its severity are biological which directly affects the brains ability to differentiate between a self-created reality and objective reality. Judgment is also affected and holding Mr. Holmes accountable for allowing outside influences such as comics, films, and pop-culture notions to alter his “reality”, is dubious at best. And what about the accountability to those around James as he reached out for help, or showed signs of mental instability? Should they also be put on trial? Our ‘system’ would most likely find any person exposed to him innocent of wrong doing, and not accountable. It begs to question whether religion or psychological paradigms would have made James more self-aware, and autonomous to manage his own biological condition. And what would need to be in place for James to seek them out voluntarily? Influence is all around us, at all times, and can be detrimental to the development of the mind, even with a biological condition in place. Society as a whole imposes its influence then there are the individual influences to consider. You have to ask yourself, could this be me? Leaves one to wonder, how many people would be willing to ask themselves that question and answer it earnestly. I’m sure in your own reality you would. In objective reality, you are human, and your humanity may cause you to identify with the victims, allow that identification to cause a reaction in your own brain, and see this man as the Villain he himself painted for you to see. Perhaps we really are destined to go on like this forever. Good vs. Evil, and the evil deeds of men are to be punished. Even if we bask in the shadow of the Dark Knight. This entry was posted in Imported and tagged Batman Shooter, Colorado Massacre, James Holmes, sin jones. Bookmark the permalink.